Nose: The nose starts off with subtle sherry flavours, nicely mixed with dried apricots, tangerines and red apples. Gentle spices emerge with oak, cinnamon and caramelised ginger, followed by vanilla, a whiff of dark chocolate, and faint smoke in the back. Palate: Sweet and fruity on the palate with vanilla, dried apricots and a touch of pink grapefruit. This is immediately complemented with a bold spiciness of oak, black pepper, cinnamon, candied ginger and aniseed. Lingering notes of hazelnut and cocoa towards the finish. Nicely mouthfilling. Finish: The finish shows good length with a warming and dry spiciness of oak and pepper, followed by slightly bitter grapefruit peel on the tail. With water: Fresher on the nose by adding a few drops of water. Fruity with strawberries and red currant, followed by spiced oak and aniseed in the back. Very fruity on the palate with red currant and brambles and a creamy sweetness of vanilla and blossom honey. The bold spiciness is significantly tamed. The finish is medium long, slightly warm and creamy with prickling oak in the back. Comments: An attractive example of this great ignored Speyside distillery. Beautifully rounded, characterful, and well-balanced. 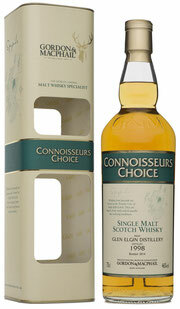 Juicy fruit and rich spice give a perfect level of attitude to this dram with a pretty long and enjoyable finish. Nicely complex and very tasty. Works well with a few drops of water bringing the lovely fruitiness to the fore.